Protect your ankle! 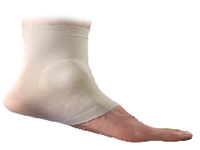 The Ankle Sleeve has two soft polymer gel pads moulded into the elastic sleeve to protect both the medial and lateral malleolar. Comfortably conforms over the ankle to cushion and protect the ankle from abrasion, friction, shearing forces, chafing and callus formation. One size fits left or right ankle.